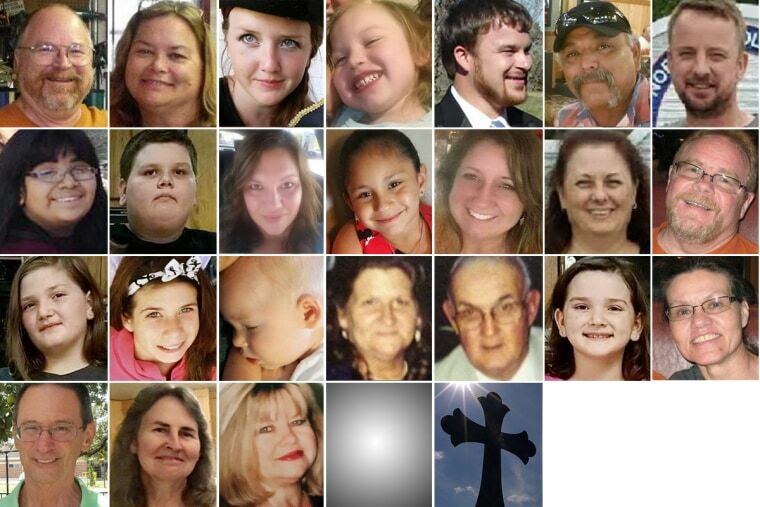 24 of the victims of the Texas church shooting. It was like any other Sunday morning inside of their tiny Texas church, until a gunman's unexplained rampage stole the lives of 26 people: mothers, fathers, siblings, grandparents and more than a dozen children. By the time the last bullet was fired, the victims — ranging from a pregnant woman and her unborn child to a 77-year-old grandfather — were left to die inside the First Baptist Church in Sutherland Springs. The tragedy shattered the rural community's sense of peace, as it became the deadliest shooting inside a house of worship in modern U.S. history. Among those killed was the 14-year-old daughter of Frank Pomeroy, First Baptist's pastor. During an emotional news conference Monday, Pomeroy's wife struggled to find the words to describe her grief after both her and her husband happened to avoid the shooting because they were out of town. "Our church was not comprised of members or parishioners, we were a very close family," Sherri Pomeroy said. "We ate together, we laughed together, we cried together and we worshiped together. Now, most of our church family is gone." Annabelle, also known as Belle, loved attending her father's church, so much so that family members said she would beg to sit in the front row — even when her parents weren't there. Jason McKey, one of Pomeroy's cousins, told Houston’s KHOU 11 that the family adopted Annabelle when she was young and raised her in their faith. McKey said he feels the 14-year-old "died for her faith." Sherri Pomeroy added that First Baptist was another family to her daughter. "One thing that gives me a sliver of encouragement is that Belle was surrounded by her church family, which she loved fiercely, and vice versa," Pomeroy said. "As senseless as this tragedy was, our sweet Belle would not have been able to deal with losing so much family yesterday." Braden, 62, was the kind of man who would sit and play for hours with his nieces and nephews, relatives said. Braden's older brother, Bruce, told The Washington Post that his brother had served in the Army National Guard and worked in the dairy department of a local grocery store. "And he was a very good husband, who loved life, and loved smiling and joking around," Bruce Braden said, "and he was very good with kids." Bruce Braden told The Post he had watched the news coverage of the shooting and noticed that people were posting on his sister-in-law's Facebook page to see if she was OK. Initially, he said, he thought anchors mentioned another city, but when they came back to Sutherland Springs, he grew concerned. "I walk around trying not to cry," he said. "It leaves, just, a big hole. And sometimes you feel numb and dead inside." Bruce Braden told the Indianapolis Star that his brother's wife, Debbie, and their granddaughter were also injured in the shooting, but were expected to survive. Family and friends held a candlelight vigil Monday for the Corrigans. The couple graduated from Harrison High School, just outside of Detroit, according to NBC affiliate WDIV. The Corrigans were a military family and Robert, 51, was retired from the Air Force, said Renee Haley, the director of Veterans' Services in Clare County, Michigan. His wife, Shani, was also 51. Haley said they are survived by two sons, who are on active military duty. Joe Holcombe lost children, grandchildren and great-grandchildren. In all, eight members of his extended family were killed, as well as an unborn child. "We're having a hard time," he told NBC News. Holcombe said his son, 60-year-old Bryan Holcombe, an associate pastor, was walking up to lead the church in prayer when the shots rang out. Bryan and his wife, Karla, 58, were killed. "You couldn't ask for any sweeter people in the world," said Paul Buford, a pastor who knew the couple. "I mean, Bryan had a face that would just light up a room and Karla was just as funny and joyous as you could possibly imagine." Their adult son, Marc Daniel "Danny" Holcombe, 36, and his infant daughter, Noah, who was just over a year old, were also killed. Another adult son of Bryan and Karla named John was grazed by shrapnel, but survived. But his pregnant wife, Crystal, did not. Crystal had five children. Three of them — Megan, 9, Emily, 11, and Greg, 13 — were killed; two survived. Debbie Bolf, a family friend, said Crystal, 36, was the love of John's life. "And he's lost her now,” she said. Buford, the pastor, said Crystal was a "beautiful woman in spirit" who raised "amazing" children. The pious family lived in homes near one another on family land in the woods surrounding Sutherland Springs, according to The New York Times. "They weren’t clandestine," family friend Terry Bolf told the newspaper. "Their gate was always open." Asked how he was coping with the loss of his son, Bryan, Joe Holcombe said that he will see him in heaven. "He's gone home," he said, smiling. "We'll be together again for a long time." Friends and family described Dennis and Sara Johnson as a loving couple and devoted members of the First Baptist congregation for more than a decade. Dennis Johnson, 77, was a church elder and a veteran of both the U.S. Navy Reserves and the Army National Guard. Relatives say Sara Johnson, 68, was a devoted mother who loved caring for children and worked in a church nursery for more than 30 years. The couple had recently celebrated their 44th anniversary in July. Their daughter, Kati Wall, said she wants people to remember the lives her parents shared together. "We want them remembered for the amazing people they were and not for how their lives ended," Wall said. "They were so much more than that and deserve better." A GoFundMe site was created to help raise funds for the couple's funeral expenses. The Johnsons are survived by their six children and several grandchildren, and were expecting great-grandchildren as well, according to the site. Haley, 16, loved babies and dreamed of becoming a nurse in a neonatal intensive care unit, according to a family friend. She was a "beautiful, vibrant" girl, family friend Tasha Niemann Wiatrek said on a GoFundMe page. Haley "was excited about the bright future ahead of her." Robert "Scott" Marshall and his wife, Karen, were reportedly first-time visitors in search of a new home church when they walked into First Baptist on Sunday. Marshall's father, also named Robert, told NBC affiliate WPXI that his son and daughter-in-law, both 56, were originally from the Pittsburgh area. He said they recently moved to Texas so that Karen could be closer to her family. Initially, the family wasn't sure if the couple were at the church. The elder Marshall said one of his grandsons drove to Sutherland Springs to see if his father's car was there — it was. "I'm still numb," the elder Marshall told WPXI. "The shock won't be out for awhile." McNulty, 33, worked at the Aumont Saloon in Seguin, east of San Antonio, and the restaurant launched a GoFundMe page to raise money for her family. 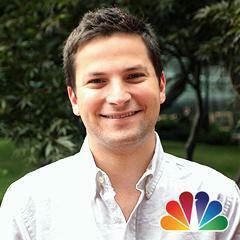 A former employer confirmed her death to NBC News. A colleague, Amy Woodall, described McNulty as a "sweet, kind and loving woman" who will be "missed by many." “She was conscientious, engaging, and always willing to do the little things," Woodall wrote on the fundraising site. "Words cannot express the sadness that this tragedy has caused." Ricardo Rodriguez, 64, and his wife Therese, 66, were also among the victims of the shooting, family members told NBC News. Joann Ward, 30, was attending church services with her children when the gunman opened fire. Relatives confirmed that Ward and her young daughters, Brooke, 5, and Emily, 7, were killed. Nearly half of the victims of the mass shooting were children. Ward's 5-year-old stepson, Ryland, was shot five times. His uncle, Michael Ward, told The Dallas Morning News that he carried his nephew out of First Baptist when the shooting stopped. He was flown to a hospital in San Antonio and is now in critical but stable condition. Kelly Lookingbill, Ward's sister, told NBC News that Joann Ward was a "wonderful giving person." "My sister was the best mom," Lookingbill said. "She would do anything for her babies. She would do anything for her family, period. She had the biggest heart." Warden had weathered a difficult year. Family members told NBC affiliate WOIC that her husband, Christopher, died earlier in 2017 and that her father had also died before him. But despite the troubles in her own life, Warden always found comfort in her church, where she worked as a volunteer teacher, said her brother, Jimmy Stevens. "It was always her goal to serve and teach children the word of God," Stevens told WOIC. "There was nothing she would have rather done. And she served people basically her whole life." Relatives said 56-year-old Warden was shot while she attempted to shield her 18-year-old grandson, Zachary Poston, form the spray of bullets. Poston survived, but his family said he suffered six gunshot wounds. His grandmother was killed. "She died serving the Lord and helping someone who needed it. And that's what she lived for," Stevens said. "So that is a victory, but she will be missed every day of my life, forever." Investigators said Devin Patrick Kelley allegedly opened fire on First Baptist Church after a family dispute with his mother-in-law, who attended the church. Although she wasn’t at the service, Lula Woicinski White — his wife’s grandmother — was there. White, 71, was killed in the shooting, family members told the Associated Press. White’s sister, Mishler Clyburn, told The New York Daily News that she felt she lost her best friend. “My sister was a wonderful, caring person — a God-loving person,” Clyburn said. “She loved the people in her church. They were all her best friends. CORRECTION (Nov. 8, 2:04 p.m.): An earlier version of this article misspelled the first name of one of the victims. Her name is Brooke Ward, not Brook. Gabe Gutierrez, Rima Abdelkader and Caitlin Fichtel contributed.